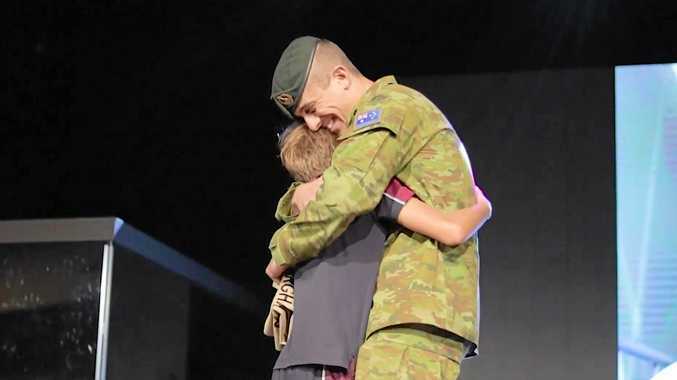 WILLIAM Anderson had not seen his dad Michael for seven months when they were surprisingly reunited at a Highlands Christian College school assembly in Toowoomba. 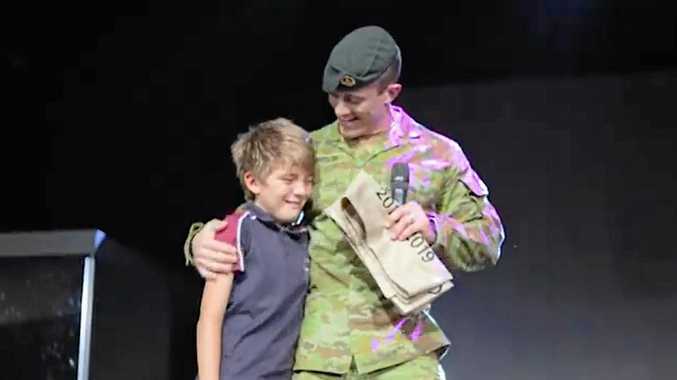 Lieutenant Michael Anderson was recently deployed in Afghanistan with the Australian Defence Force's Protection Element 10 and had told his year five son he would return to Australia on March 7. Instead, he surprised his son by appearing on stage at a whole-school assembly on March 1, with a video of the moment going viral online. "I was so shocked," William said. "I had no idea anything was actually happening, when he came on stage I thought it was someone else (at first). "It was really special for me." The moment came about after weeks of planning between the school's assistant principal Warren Seip, teachers and William's family. "(When his dad left for Afghanistan) he and his teacher talked about it and decided to start a little experiment," Mr Seip said. "They sent care packages to dad... and pretty soon his classmates wanted to get involved. "They Skyped with William's dad and then other members of his platoon started to get involved as well." It then snowballed into the whole primary school becoming involved. 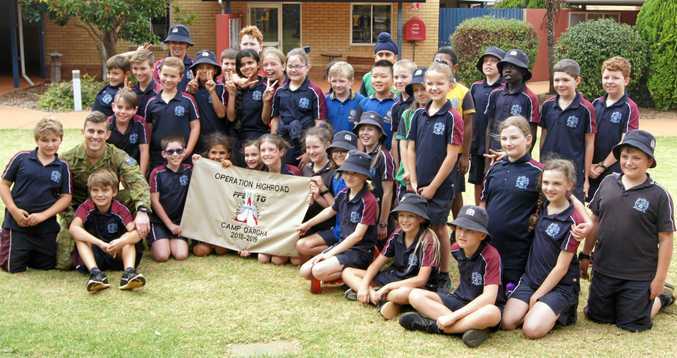 "The students sang Christmas carols over Skype, they sent letters and cards, Tim Tams, cups of soup," Mr Seip said. "They wanted to give the soldiers some new dad jokes as they knew a lot of the service men and women were parents themselves. "When William's father came to visit, the students, especially in William's class, were asking about specific soldiers they got to know during that time." Mr Seip said Lt Anderson got in contact with the school a few weeks ago when he was planning his return to Australia. "He contacted me and said they'd really appreciated (the care packages) so much and they wanted to give the school a gift to say thank you, and he wanted to surprise his son," Mr Seip said. "We thought why not get the whole school community there to share in that as they shared in the journey. "It was just a special opportunity to be able to reunite them. 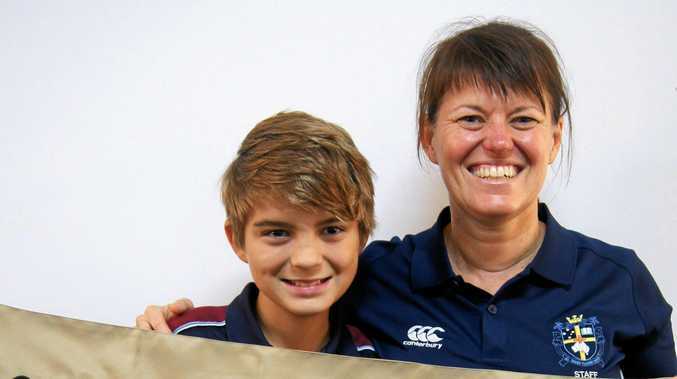 William is a great kid and it was just an honour to help bring them back together." William said he would remember that moment, and the school community coming together to support him, his dad and the platoon, for the rest of his life. "I cannot believe I cried in front of the school," William said. A heartwarming video of the encounter published on the school's Facebook page has now been viewed over 20,000 times by people all over the world. "It makes me really happy," William said when told about the views. "There are a lot of other children whose parents serve overseas. "I'm just so lucky to have my teachers, classmates and school community supporting me." Lt Anderson, who is back at his base in Enoggera, near Brisbane, said in the video he was thankful to the school community for the support. "That support goes a long way with all the soldiers," he said. "It gives us plenty of fond memories." The school was gifted a rectangular banner with 'Operation Highroad Camp Qargha 2018-2019' written across one side, with the signatures of platoon members who had been touched by the school's generosity.